HOUSTON (AP) — This postseason may be best remembered for its bullpen openers. Just not in the AL Division Series between the Houston Astros and Cleveland Indians. Relief pitchers are covering entire games for other championship contenders this October, but the Astros and Indians are ready to roll old school, starting with Cy Young Award winners Justin Verlander and Corey Kluber facing off in Game 1 on Friday. Cleveland knows the feeling. This series will feature some of the best pitchers in the American League, with Cleveland’s Carlos Carrasco opposing two-time All-Star right-hander Gerrit Cole in the second game Saturday, and Mike Clevinger of the Indians and 2015 Cy Young winner Dallas Keuchel pitching in Monday’s Game 3. 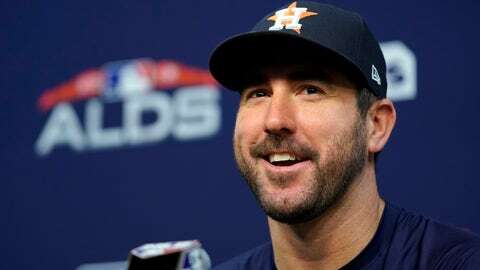 Verlander, a 14-year veteran, believes the AL West champion Astros and AL Central champion Indians have the top two rotations in the AL. He thinks the performance of each team’s starters will be paramount to success in this series. Kluber pitched well in the postseason in 2016 when the Indians fell to the Cubs in the World Series. But he struggled in the ALDS last year against the New York Yankees while dealing with an aching back. He’s feeling healthier this time around and expecting a stronger performance. “Whether a game I pitch or a month I have or a year I have is good or bad, the way I look at it is I’m looking forward to the next one … not dwelling on previous outings or games, whether they’re good or bad,” he said. Some things to look for as the Indians and Astros open this best-of-five series. Houston shortstop Carlos Correa hit .268 with 13 homers and 49 RBIs in the first half this season but struggled with a back injury for most of the second half. He missed about six weeks and hit just .180 with two homers and 16 RBIs in 37 games after the All-Star break. Though it wasn’t bothering him Thursday, the top overall pick in the 2012 draft said he isn’t sure that the problem is completely behind him. Houston’s Charlie Morton and Cleveland’s Trevor Bauer could end up starting Game 4, if necessary. However, they might also come out of the bullpen before that if any of their starters struggle. Manager Terry Francona has indicated Bauer could be used to eat up multiple innings like Andrew Miller did for the Indians in the last couple of postseasons. “Our job now is to take who we have now and get the best out of them. … If we get where we want, my guess is that Trevor’s going to be used a ton,” Francona said. Third baseman Josh Donaldson, the 2015 AL MVP, spent most of the season on the disabled list with various injuries before being traded from Toronto to Cleveland on Aug. 31. He looked good in limited action at the end of the season, hitting .280 with three homers and seven RBIs in 16 games. The Indians hope he regains the form he’s shown in five career postseasons where he’s hit .292 with four homers and 13 RBIs. He’s looking forward to contributing after the tough path it took to get back on the field this year. Both the Astros and the Indians used one of their final roster spots on players who are valuable for their speed. Houston picked rookie Myles Straw over carrying a third catcher and the Indians went with Rajai Davis over backup shortstop Erik Gonzalez. Straw has been used almost exclusively as a pinch-runner since being called up on Sept. 15, and Hinch raved about what a player like him can do for a team in the postseason. Davis was big for the Indians during their 2016 playoff run, hitting a tying home run in Game 7 of the World Series that Cleveland lost to the Cubs in 10 innings. The speedy Davis has proven to still be a threat on the bases this season and has 21 steals despite approaching his 38th birthday. Donaldson said the speed of Davis could really help Cleveland this postseason.